Saint Bonaventure (b. 1221, d. 1274) known as “the seraphic doctor,” received the name of Bonaventure as the result of an exclamation of St. Francis of Assisi, when he prayed for John’s recovery from a dangerous childhood illness, and, foreseeing his future greatness, cried out “O Buona ventura” — O good fortune! 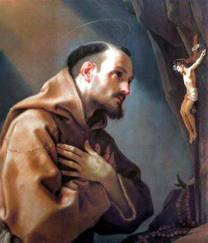 At the age of twenty-two St. Bonaventure entered the Franciscan order. In Paris he became the intimate friend of the great Saint Thomas Aquinas and like Saint Thomas, enjoyed the friendship of the holy King, Saint Louis. In fifteen talks given in June of 2012, Brother Brian taught St. Bonaventure’s spirituality of Christ’s love. Drawing mainly from St. Bonaventure’s short essay, “Journey of the Mind into God,” (hereafter referred to as Journey — see the bottom of this page for an Internet source for the full text), participants were led to a deeper understanding of this professor, preacher, and successor to St. Francis of Assisi, his life, his times, his Franciscan spirituality, and the contributions that led to his being given the title Doctor of the Church. This Saint gave us prayers and explanations of Church doctrine that have enlightened and enlivened many for 700 years. Here are some excerpts from the class notes on St. Bonaventure’s writing prepared by Brother Brian; the complete text can be found by following the blue link. See Bro. Brian Dybowski’s interview on St. Bonaventure on Spirituality TV. The Paulist Press series “Classics of Western Spirituality” includes a volume called Bonaventure.